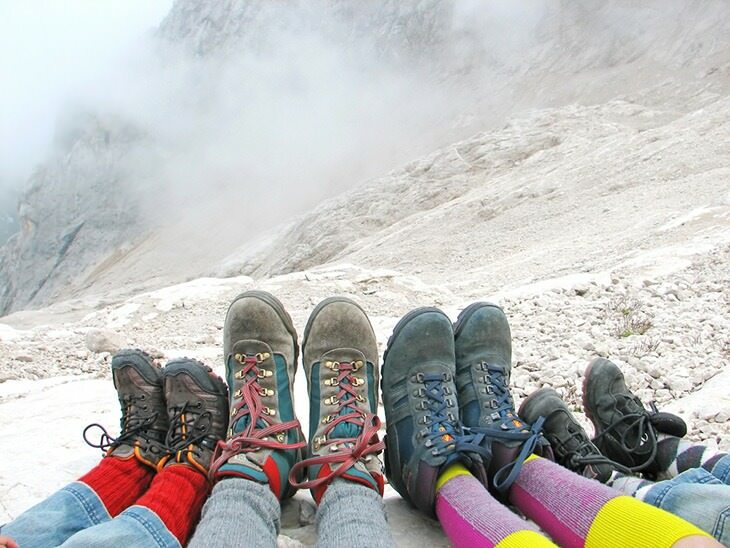 An author and quotation anthologist Terri Guillemets once wrote that “You need special shoes for hiking — and a bit of a special soul as well.” And while all that is true, she forgets to mention one more important necessity – special socks. 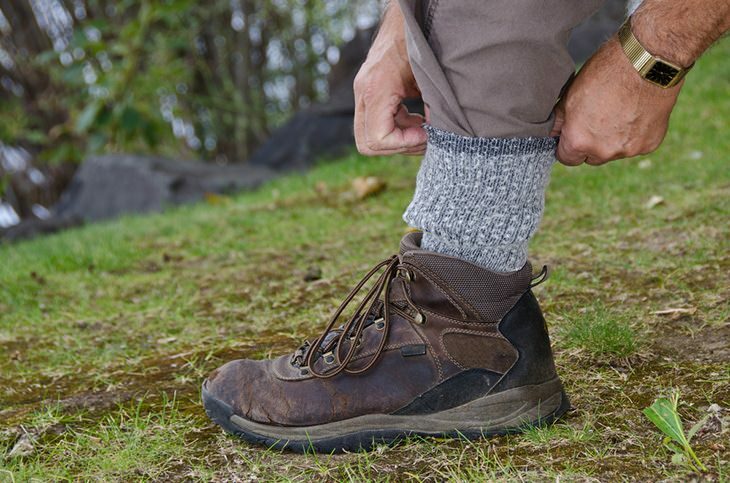 ​Although this may seem like a trinket and an easy find, a good pair of sturdy hiking socks may make your walk more bearable, but the trick is that a good pair of hiking socks is hard to find. The market is overcrowded with a variety of brands, lengths, and colors each with a different purpose. In this guide, we’ll help you find the best socks for hiking on the market, by comparing five great products. But first, we’ll go through some criteria good socks have to meet so that you can know how to choose a pair that matches your needs. The most obvious advantage of Darn Tough socks is that they are made of merino wool (67%) which is a great insulator and can keep you really warm in cold conditions. Besides, merino wool is antibacterial and antimicrobial. The construction is great, and there are no performance issues (no blisters, no slipping, and no bunching). 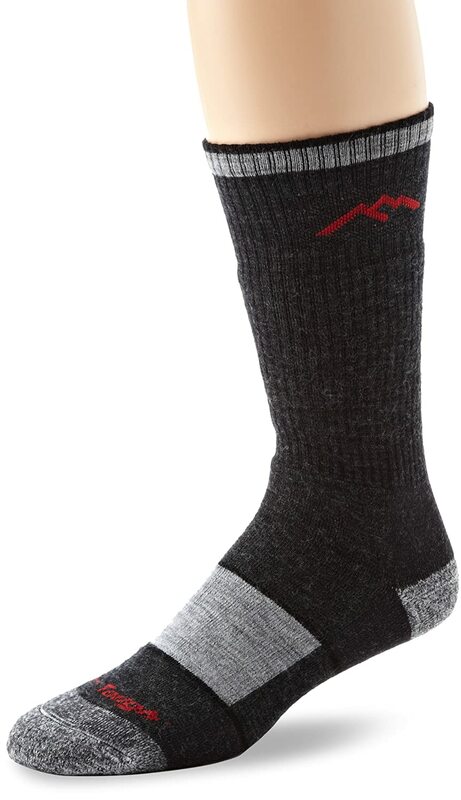 Another product from reliable Vermont’s manufacturer, the Hiker Micro Crew socks are made of merino wool (61%), nylon (36%), and Lycra spandex (3%). This is your go-to sock for spring and fall hiking trips. Although they cushion along the bottom of the foot, they provide perfect comfort without compromising breathability. 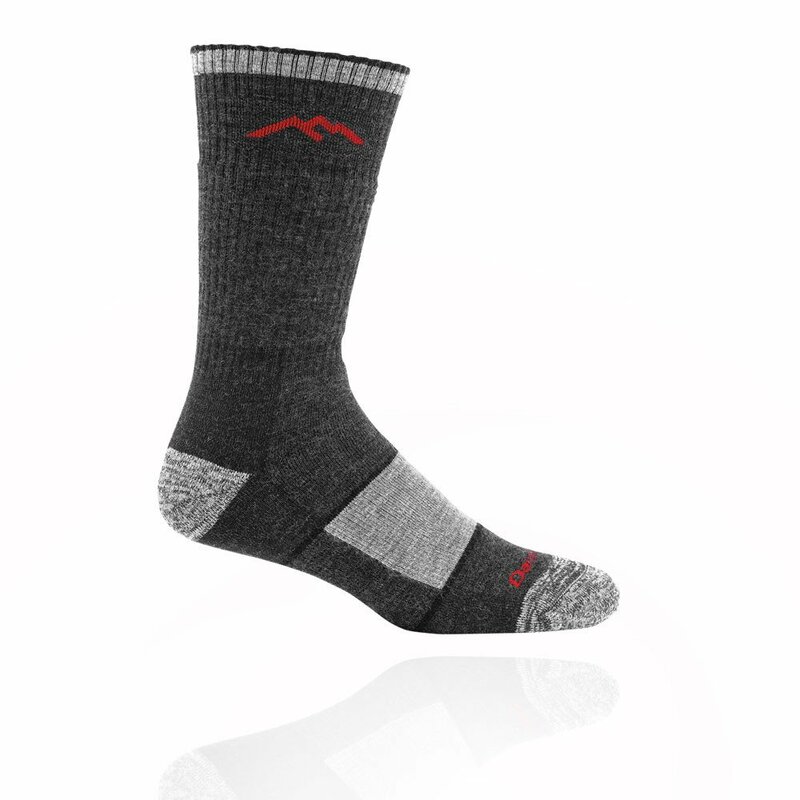 The SmartWool socks are made of merino wool (66%), nylon (33%) and elastane (1%). Like the previous two products, they are knitted in the USA. They are medium weight, which makes them ideal for spring and fall temperatures, as well as longer trips that prioritize great breathability. These socks provide medium cushioning to absorb the trail impact, so, although they are not very suitable for highly-demanding trails, they perform rather well on medium though terrains. This interesting pair of socks is made of NuWool (64%), nylon (33%) and lycra (3%). They are mid-weight, which means that you should choose them for spring or fall trips or long hiking tours. The thermal regulation is excellent, and the material gives away very soft feel. The Injinji’s socks provide astonishing odor control. One obvious difference between them and the previously mentioned pairs is that these socks have an anatomical five-toe design that reduces blistering. Unlike the previously reviewed products, these socks are intended for women. As for the build material, they are made of olefin (40%), acrylic (36%), stretch nylon (20%), and spandex (4%). They are wool-free so don’t expect great insulation here. Because of the lack of wool, they are best for warmer months. On the bright side, they are equipped with Ultimax moisture control, and it works like a charm for blister protection. Before you even begin searching for an appropriate pair of socks, you must ask yourself what type of socks you really need. Socks are usually designed with activity type, environmental conditions and intensity level in mind. For instance, a high-intensity activity like running requires breathable and lightweight material. 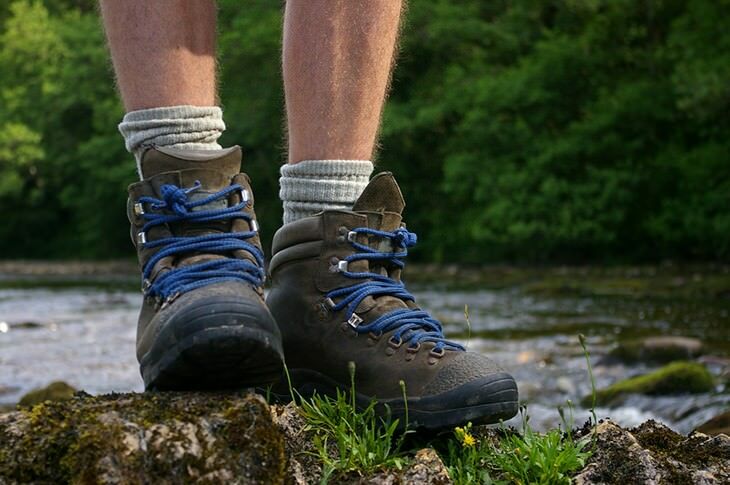 Hiking socks are usually high-ankle to mid-calf height, and their design prioritizes comfort, warmth, and breathability. They are meant for multi-day trips and walking on uncomfortable terrains, so they provide additional padding for protection. ​It is essential to differentiate hiking socks from other types like skiing/mountaineering types which are typically longer and very thick. 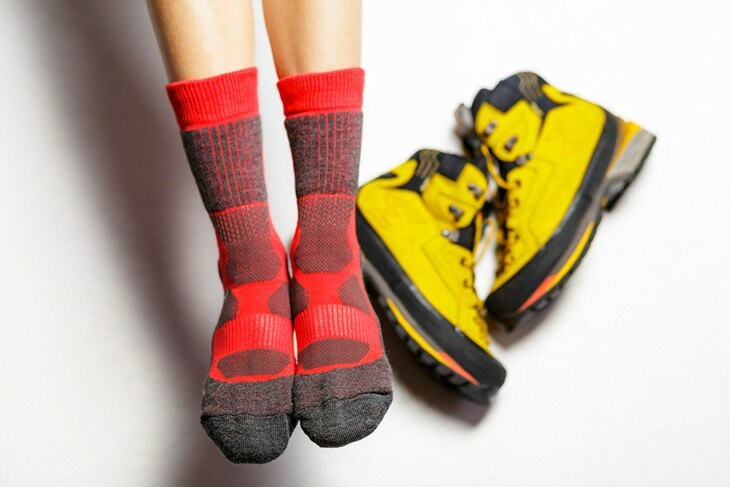 The material is the most important factor to consider when choosing hiking socks because it determines the level of comfort, warmth, and breathability, as well as the socks’ ability to keep your feet dry while the weather is cold and wet. Before you learn which material is the best, you have to discover which one is the worst for hiking, and that is definitely cotton. When on a hiking trip, it is highly likely that your feet will get wet, and cotton doesn’t insulate well when wet. On the contrary, it even keeps the moisture close to the skin. Such situation can, in the worse case, lead to hypothermia. The best material – wool – keeps the moisture away from your skin and retains the heat. It doesn’t dry as fast as cotton, but it keeps your feet warm. Wool or wool blend socks have the ability to regulate temperature, and they can even cool you down in warmer conditions. Synthetic materials also have their benefits. Regardless of the prevailing material in your hiking socks, you should search for a pair that includes lycra, nylon or spandex component because they are stretchy and therefore ensure the sock is in place and increase breathability. Ultra-lightweight is the material you choose when the weather is hot or warm. The priorities of socks made of this material are minimal padding and breathability, and it is much thinner than the other materials. Lightweight socks are ideal for warm weather and high-intensity activities. Although they do have less cushioning than mid-weight socks, they are still more suitable for demanding terrains than the ultra-lightweight. Mid-weight materials are intended for fall temperature and longer trips. They are very versatile since they still have high levels of breathability and comfort. Heavyweight socks should be your choice for cold weather and demanding terrains. 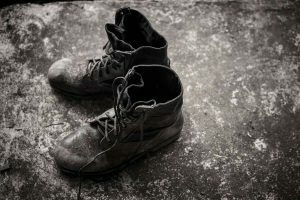 They have heavy padding in the forefoot and heel to keep you warm and comfortable, but they also provide much less breathability than previous mentions. 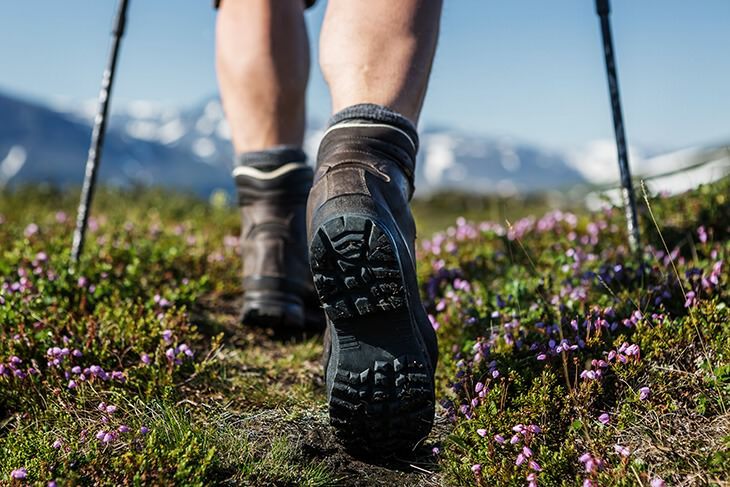 Most hiking socks come up slightly past the ankle or halfway up the calf so that they can protect your skin from the elements and prevent chafing from hiking boots. However, if you are wearing aggressive hiking shoes, you should probably go with shorter socks. 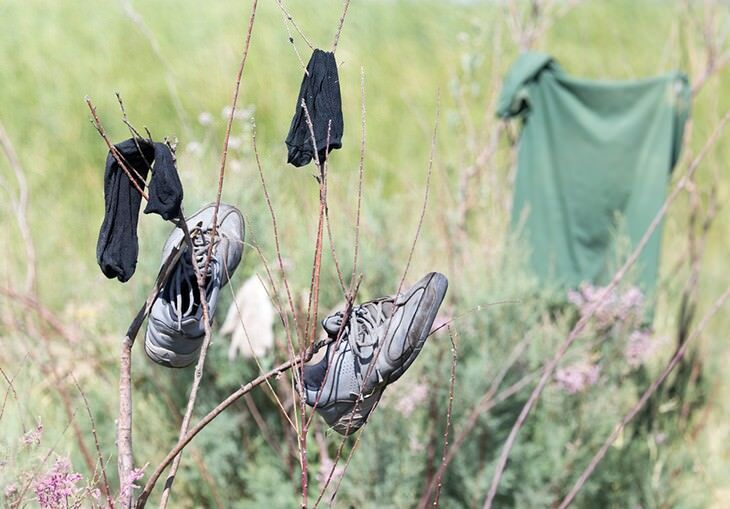 Also, taller socks are a better option if you are hiking in areas with heavy grass, and if you are walking in the desert or another dry area, you will feel better in a shorter, more breathable pair. A good fitting is an essential factor if you want to have a successful hiking trip. The best way to ensure the sock fits you is to pay attention to the sizing guides on the packaging. Not that men and women’s sizing charts are different, so look at the correct gender. You can also take some time to try out different socks in the store. Even some online distributors will give you a trial period after which you have to give the socks back if they don’t fit you. How you choose your socks will depend on the length and conditions of your trip, but the usual rule of the thumb is to seek to cushion on areas like toes and heels and compression panels around the arches. As for the insulation, wool is well-known as one of the best insulators out there, so you can’t go wrong with this comfy material. It is imperative to mention that it is near to impossible to find a sock that has great insulation abilities that will dry fast. The thinner the material, the faster it will dry. If you are going on a multi-day trip where you don’t require very warm socks, you can find a great co-traveler in a lightweight sock that doesn’t absorb moisture quickly. Most hiking socks will come up just past the ankle or halfway up the calf. This is intended to protect your skin from the elements (i.e. brush, grasses, etc.) and to prevent chafing from hiking boots. The most obvious advantage of Darn Tough socks is that they are made of merino wool (67%) which is a great insulator and can keep you really warm in cold conditions. Besides, merino wool is antibacterial and antimicrobial. 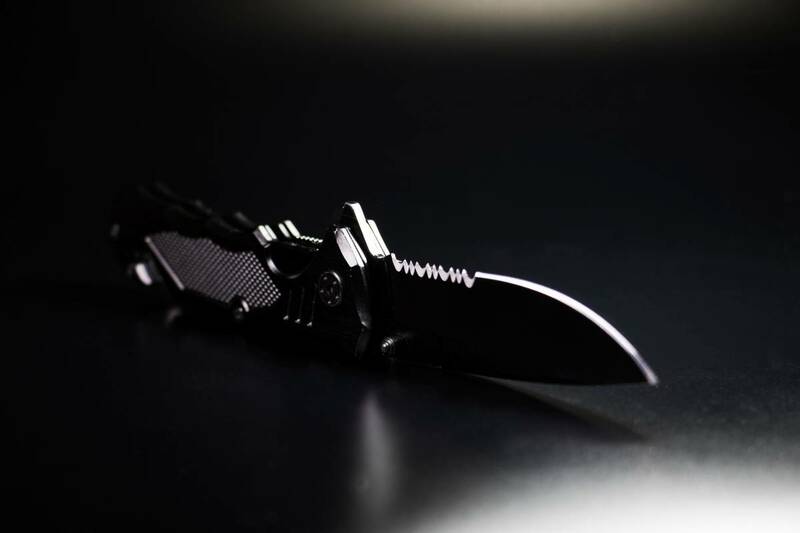 The construction is great, and there are no performance issues (no blisters, no slipping, and no bunching). ​Fine gauge knitting makes these socks supremely comfortable. They also feature dense cushioning all around the foot and around the shin, so they provide you with full protection. The Elastic in the arches is great for supporting the foot. There is a ribbing above the ankle to ensure a proper fit. If you take a single glance at the Darn Tough socks, you can see that they are built to maintain their shape and sturdiness on long trips, especially when you notice that they have reinforced heels and toes. If there is one obvious flaw of these socks that is the lack of individual left/right sock, since they tend to shape according to your feet and it is very easy to swap them, which, eventually leads to stretching them. The price isn’t very great either since they don’t look very well after the first washing. The most obvious advantage of Darn Tough socks is that they are made of merino wool (67%) which is a great insulator and can keep you really warm in cold conditions.Besides, merino wool is antibacterial and antimicrobial. The construction is great, and there are no performance issues (no blisters, no slipping, and no bunching). The reinforced heels and toes are good additions. 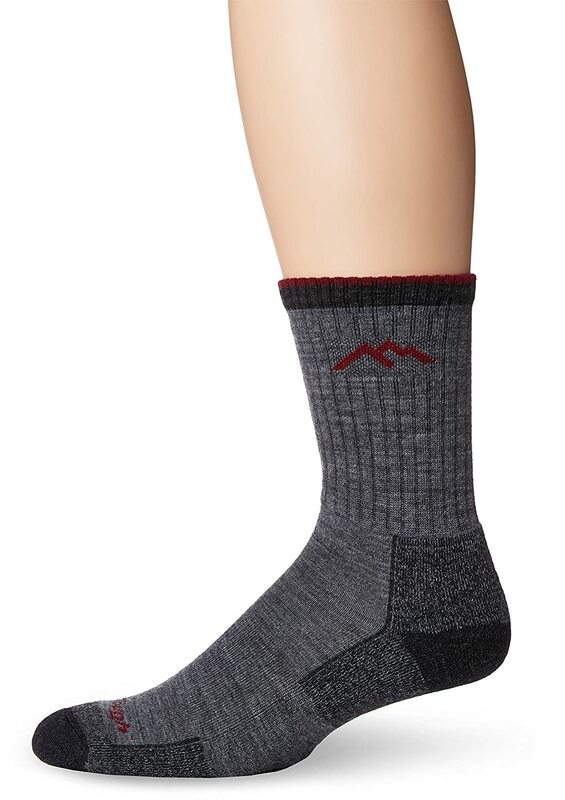 Another product from reliable Vermont’s manufacturer, the Hiker Micro Crew socks are made of merino wool (61%), nylon (36%), and Lycra spandex (3%). This is your go-to sock for spring and fall hiking trips. Although they cushion along the bottom of the foot, they provide perfect comfort without compromising breathability. ​A very good feature of these socks is that they repel odor, and although they are made of 60% wool, they are reasonably quick to dry. Although the socks tend to stretch a little, the pair does have a lifetime warranty, so you don’t have to worry about wear and tear. The leg band on the sock can be a little tighter, so it can get somewhat uncomfortable especially on multi-days hiking trips, but all in all, it feels good to wear them. Also, the socks can shrink a bit after machine washing and drying. 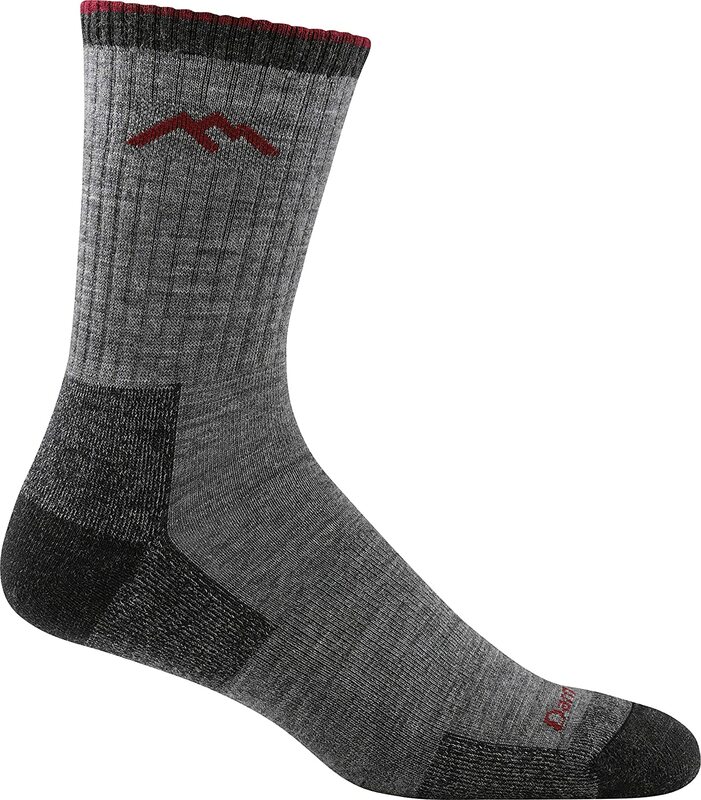 Another product from reliable Vermont’s manufacturer, the Hiker Micro Crew socks are made of merino wool (61%), nylon (36%), and Lycra spandex (3%). 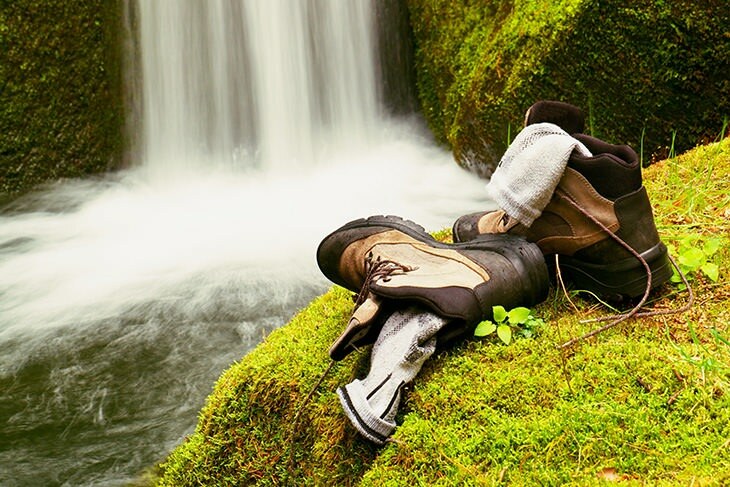 This is your go-to sock for spring and fall hiking trips.Although they cushion along the bottom of the foot, they provide perfect comfort without compromising breathability. 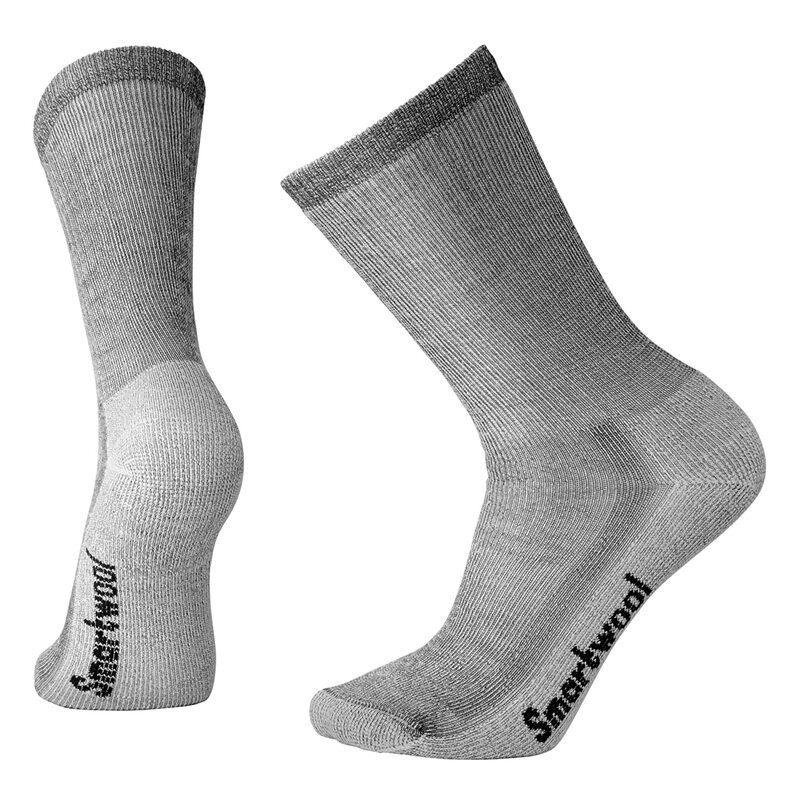 The SmartWool socks are made of merino wool (66%), nylon (33%) and elastane (1%). Like the previous two products, they are knitted in the USA. They are medium weight, which makes them ideal for spring and fall temperatures, as well as longer trips that prioritize great breathability. These socks provide medium cushioning to absorb the trail impact, so, although they are not very suitable for highly-demanding trails, they perform rather well on medium though terrains. ​The elasticized arch brace holds the sock in place without disrupting your movement in any way. Another addition that keeps the foot cozy is the flat-knit toe seam. ​However, the socks are a bit tight for persons with large calves, so keep that in mind when purchasing. Another issue we had with these socks is that they seem to be wearing a bit thin at the heels and toes after some time. Also, the sock tends to fit somewhat big, even if you buy them according to the sizing chart, but they do shrink after several times of washing. 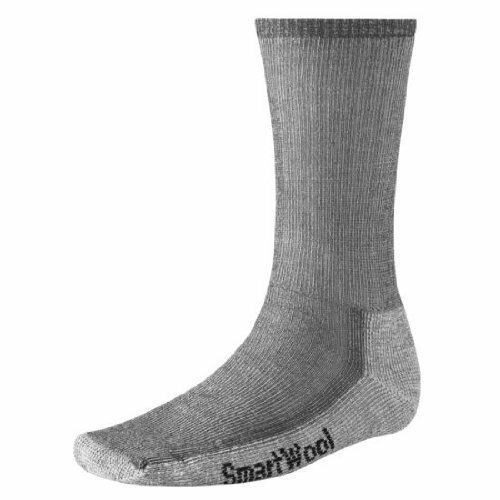 The SmartWool socks are made of merino wool (66%), nylon (33%) and elastane (1%). Like the previous two products, they are knitted in the USA. They are medium weight, which makes them ideal for spring and fall temperatures, as well as longer trips that prioritize great breathability.These socks provide medium cushioning to absorb the trail impact, so, although they are not very suitable for highly-demanding trails, they perform rather well on medium though terrains. This interesting pair of socks is made of NuWool (64%), nylon (33%) and lycra (3%). They are mid-weight, which means that you should choose them for spring or fall trips or long hiking tours. The thermal regulation is excellent, and the material gives away very soft feel. The Injinji’s socks provide astonishing odor control. One obvious difference between them and the previously mentioned pairs is that these socks have an anatomical five-toe design that reduces blistering. Additionally, the top mesh ensures decent breathability. 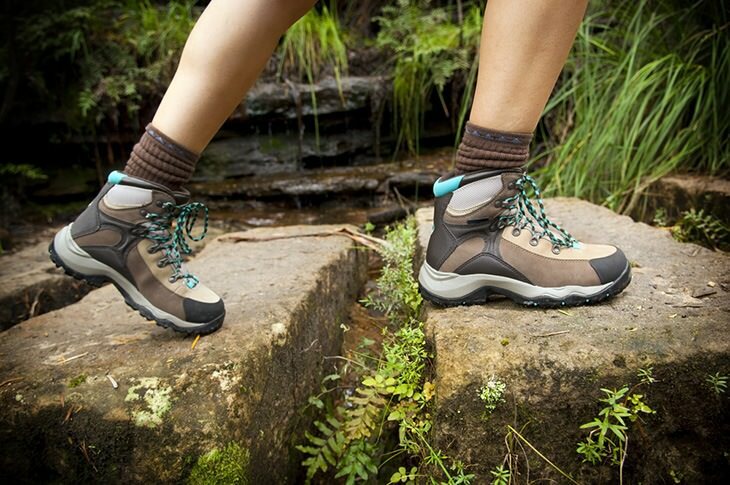 ​The underfoot cushioning and arch support make them ideal for rugged trails. 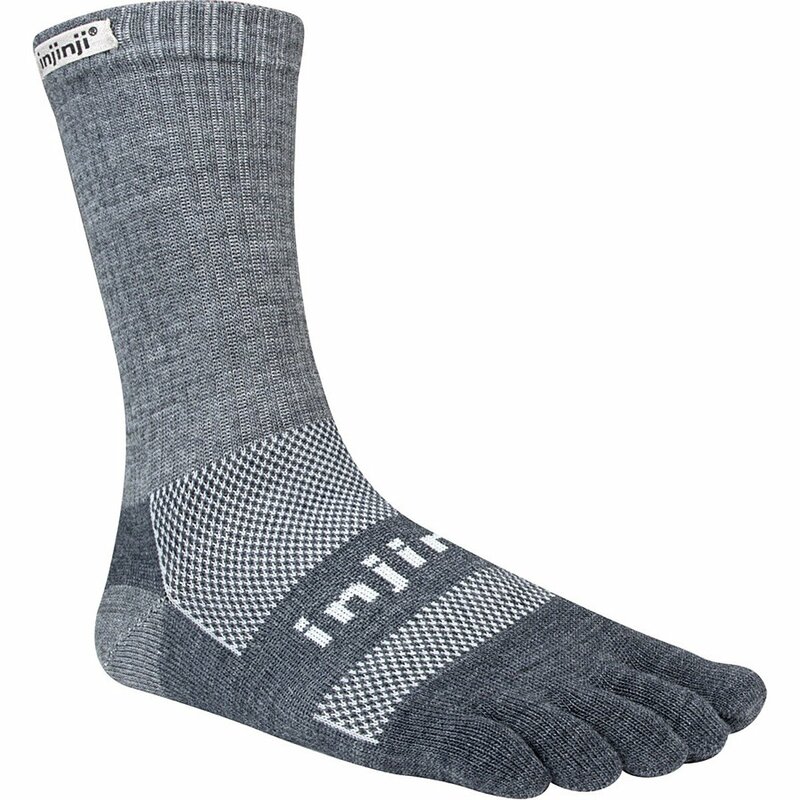 The first problem that arouses with Injinji socks is the one-year manufacturer’s warranty. Compared with, for example, Darn Tough products, that is negligible. If you think that the problems stop there, you couldn’t be more wrong, though. The socks are a bit stiff, which can result in discomfort and the toes can be somewhat short for some people. Also, the toes can get colder than with regular socks. This interesting pair of socks is made of NuWool (64%), nylon (33%) and lycra (3%). They are mid-weight, which means that you should choose them for spring or fall trips or long hiking tours.The thermal regulation is excellent, and the material gives away very soft feel. The Injinji’s socks provide astonishing odor control. One obvious difference between them and the previously mentioned pairs is that these socks have an anatomical five-toe design that reduces blistering. Unlike the previously reviewed products, these socks are intended for women. As for the build material, they are made of olefin (40%), acrylic (36%), stretch nylon (20%), and spandex (4%). They are wool-free so don’t expect great insulation here. Because of the lack of wool, they are best for warmer months. On the bright side, they are equipped with Ultimax moisture control, and it works like a charm for blister protection. ​Wigwam’s socks have a cushioned sole, so although lightweight, they can provide you with adequate protection on slightly rugged terrains. The seamless toe closure offers great comfort, and they really have great results in casual walks and hiking on not very demanding and wet terrains. As with the previous models, they also excel in odor control. However, the insulation is poor in warm conditions too, so your feet can get really warm when wearing them for prolonged period of time. They carry the same flaw as some previously reviewed products, of being too tight around the calves, but if you have thin calves, you should be able to enjoy them. Unlike the previously reviewed products, these socks are intended for women. As for the build material, they are made of olefin (40%), acrylic (36%), stretch nylon (20%), and spandex (4%). They are wool-free so don’t expect great insulation here. 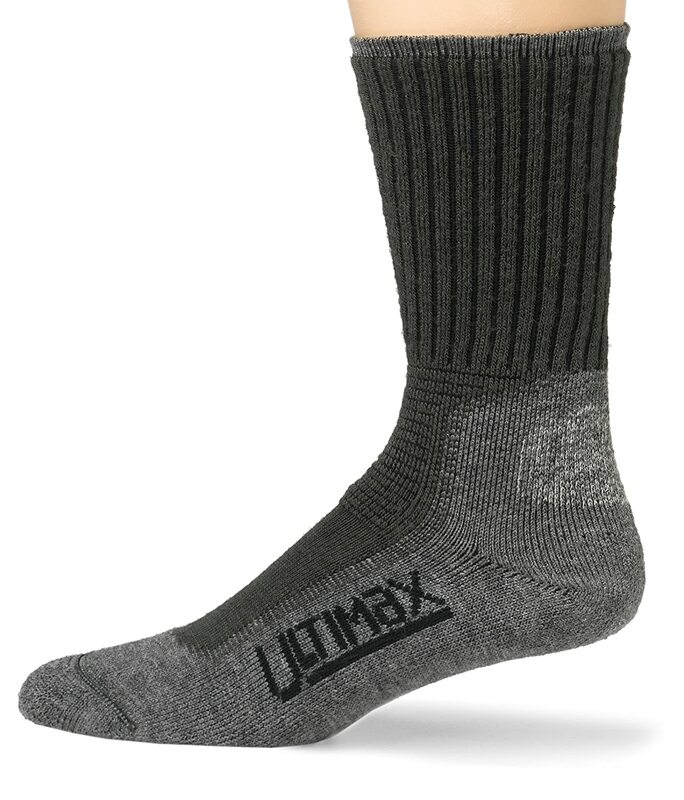 Because of the lack of wool, they are best for warmer months.On the bright side, they are equipped with Ultimax moisture control, and it works like a charm for blister protection. With all things said, it is obvious that each of these pairs has its unique perks. And while we have to give credit to the three last products for even competing in this category and for affordable prices, we can’t deny the appeal of lifelong warranty Darn Tough is offering for their socks. As for the two competitors that come from the same family, we have to give a slight advantage to the first one – Darn Tough Men’s Merino Wool Hiker Boot Sock because of the great performance, construction, and support.